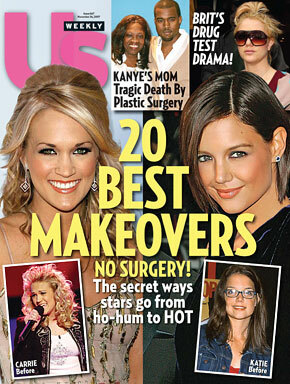 Katie Holmes, Carrie Underwood top Us Weekly's "20 Best Makeovers List"
Sometimes a star isn't just born, she's styled. Us Weekly has compiled the 20 best celebrity makeovers, and sharing the cover are Katie Holmes for "Most Improved" and country star Carrie Underwood for "Sexiest New Style." Going from girl-next-door to full-on fashionista, Holmes, the former Dawson's Creek star, wouldn't be caught dead climbing t-shirt-clad through a window these days. Project Runway's Tim Gunn tells Us of Holmes' stunning transformation: "When she first was with Tom Cruise, she looked like a kid. Now she's an elegant woman." As for Underwood, the American Idol champ who once bragged about her jeans collection is now a consistent red carpet charmer in top designers like Escada and Max Azria. "My fashion vocabulary has expanded!" says Underwood.